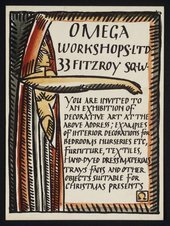 In July 1913 artist and writer Roger Fry opened Omega Workshops Ltd. at 33 Fitzroy Square in Bloomsbury, central London. The Workshops sold furniture, fabrics and household accessories designed and made by artists. The premises in Fitzroy Square included studios where products were designed and made, and public showrooms where customers could browse and buy Omega's designs. The Workshops employed a business manager, a caretaker and a group of artist assistants. Its directors were Roger Fry and his artist friends Vanessa Bell and Duncan Grant, who he had met through the Bloomsbury Group. As well as starting the Omega Workshops, Roger Fry was the driving force behind it. Similar artist enterprises had aimed to bring art and design closer together, such as William Morris and the designers of the Arts and Crafts movement. But unlike Morris, Fry was not concerned with social reform or protesting against contemporary machine manufacture. He wanted to remove what he saw as the false division between the fine and decorative arts. He was keen to see some of the main ideas of modern art – such as bright colours and bold, simplified forms – used in design. 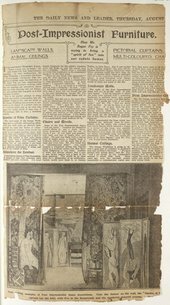 Press cutting discussing the influence of post-impressionist painting style on the furniture and household accessories created by the Omega Workshops. Roger Fry also wanted to help his artist friends. Omega Workshops provided them with the chance to make a living designing and decorating furniture, textiles and other household goods, alongside their careers as artists. Fry insisted that all Omega work was produced anonymously. He felt that objects and furniture should be bought and valued for their beauty rather than because of the reputation of the artist. Designs were unsigned and marked only with the symbol Ω, which is the Greek letter Omega. Omega is the last letter of the Greek alphabet, and in the late 19th century it was used to mean the ‘last word’ on a subject. The range of products offered by Omega was huge and included painted murals, mosaics, stained glass, furniture and textiles. In the autumn of 1914 Omega Workshops published an illustrated catalogue with text written by Fry. As well as individual products, customers were offered whole interior decorative schemes. To promote these designs three rooms at the Workshops on Fitzroy Street were decorated in the Omega style. Postcard of 'Holland Park Hall' interior designed by Omega Workshops Ltd.
Several commissions arrived to decorate private houses. Omega Workshops were also invited to show their interior designs at the Ideal Home Exhibition in 1913. They designed a sitting-room for the exhibition with designs inspired by the movement of dance. Hand dyed cushions, printed curtains, upholstery and murals all fetured these dance-inspired designs. The overlap between fine art and design can be seen in many of Omega's products. The designs, particularly those for textiles, showed the influence of modern art. They featured the bold colours and simplified forms of post-impressionist, cubist and fauvist artworks. For example, the fabric design Amenophis was based on a Roger Fry's painting Still Life, Jug and Eggs 1912. The painting with its bright flat colours and heavy black outlines is fauvist in style. The artists designed the objects and did some decorative work such as painting furniture. But the manufacture of the products was generally undertaken by firms of professional craftsmen. J. Kallenborn & Sons of Stanhope Street, London made Marquetry furniture; Druad Ltd of Leicester made tall cane seat chairs to Roger Fry’s design; and printed linens were produced by a company in France. Meanwhile, in the autumn of 1913, Fry began designing and making his own pottery. From July 1915 he also began to think about book design and publishing. With the help of the printing department at Central School of Arts and Crafts, he designed four books for Omega which were printed by a commercial firm. I’ve been meeting Daghilieff and have some hopes that later on he may give us some decorations to do for a new Ballet. I don’t suppose Duncan would care to work for the Omega now. I’ve mentioned him already and perhaps we can get two separate things to do. Only you might ask him if for example he wld. be willing to design the dresses and the Omega carry them out and Wolfe and me do the scenery of course working in conjunction and on agreed lines. What sort of employer was Omega Workshops Ltd.? Who were the artists employed to create their designs? And who bought Omega designs for their houses? Artists worked at the Omega studios for three and half days a week at a rate of thirty shillings. The rest of their time was to be devoted to their own art. There was no formal recruitment process. Instead Roger Fry visited exhibitions and art schools looking for new talent. For a time Omega became a focus for young avant-garde artists. 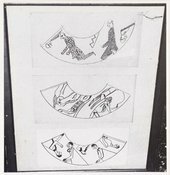 These included Frederick and Jessie Etchells, Henri Gaudier-Brzeska, Henri Doucet, Nina Hamnett, Paul Nash, Edward Wadsworth and Wyndham Lewis. Employment was very informal. With the exception of Vanessa Bell and Duncan Grant, artists were often only associated with the workshops for a short time before moving on. Omega was started up with the help of sympathetic friends and colleagues including art critic Clive Bell and playwright George Bernard Shaw. Its continuing existence relied heavily on the support of London’s wealthy artistic and literary circles. We should get all your disreputable and some of your aristocratic friends to come – and after dinner we should repair to Fitzroy Sq. where would be decorated furniture, painted walls etc. Then we should all get drunk and dance and kiss. Orders would flow in and the aristocrats would feel sure they were really in the thick of things. The products were expensive and, given the lukewarm coverage that Omega generally received from the press, their appeal was exclusive. Customers included Madame Vandervelde, Lady Cunard, and Princess Lichnowsky, wife of the German Ambassador. This painting of Lady Ottoline Morrel, another of the wealthy customers, was painted by a friend of Omega Director Duncan Grant in around 1920. Many of the patrons were also friends of Roger Fry, Duncan Grant and Vanessa Bell, the main artists behind the Workshops. These included E.M. Forster, Virginia Woolf, Clive Bell and Ethel Sands. A combination of inefficient techniques, expensive materials and a lack of orders forced Omega to close. In addition, press coverage of the workshops had not been very flattering from the start, a pattern which continued throughout Omega’s existence. By this time Roger Fry was the only original member still working regularly at Fitzroy Square. Vanessa Bell and Duncan Grant were now living at their country house in Charleston, and many of the other artists had moved on. 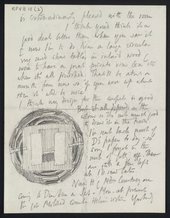 In a letter written to his friend Sir Michael Sadler on 2 June 1919, Roger Fry reveals just how much the Workshops had cost him. There were also a number of internal disputes with the company that did not help. 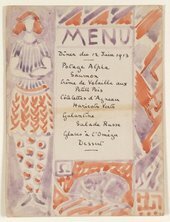 In October 1913, four of the artists who worked for Omega, Wyndham Lewis, Frederick Etchells, Edward Wadsworth and Cuthbert Hamilton, had left the workshops after a disagreement over the Omega contribution to the Ideal Home Exhibition in 1913. They sent around a letter, known as the Round Robin, to shareholders and patrons of Omega. It contained accusations against the company and in particular Roger Fry. It also ridiculed the ideology and products of Omega. The letter announced their resignation from the group and ended with the words: ‘No longer willing to form part of this unfortunate institution, we the undersigned have given up our work there’. The split ultimately led to the formation of the rival decorative workshop Rebel Art Centre and the establishment of the vorticist movement. 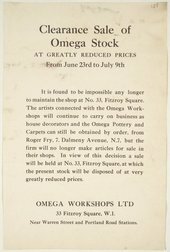 Realising that the Omega Workshops Ltd had come to an end, Roger Fry held a sale of stock in the summer of 1919. By September the workshops at 33 Fitzroy Square were cleared. Omega Workshops Ltd was officially liquidated on 24 July 1920. Although forced to close, Omega workshops played an important role in developments within interior design in the period between 1910 and 1920. Its reputation was such that it even gets a mention twenty-five years after its closure in a popular novel. In Evelyn Waugh’s Brideshead Revisited, the character Charles Ryder remembers the furnishings of his college room at Oxford. They included, (along with a print of Vincent van Gogh’s painting Sunflowers) ‘…a screen, painted by Roger Fry with a Provençal landscape, which I had bought inexpensively when the Omega workshops were sold up’.